Attracts me like, no other lady! True story. I am slightly addicted to Rhone wines, particularly Rhone reds. I’ve been on a Monastrell/Mouvedre/Mataro kick lately, but my first love really is Grenache. Of the 22 Rhone varietals, these are my go to babies. Luckily for me, I’ve been having fantastic luck lately at Whole Foods (not to mention The Spanish Table) at finding some great wine at even better prices. But really, this post is about the mother of all Rhone gatherings: Hospices du Rhône . 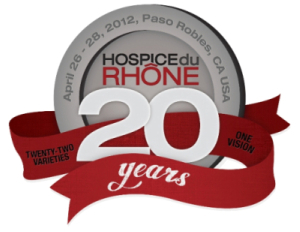 The annual Rhône celebration in Paso Robles will be celebrating her 20th anniversary next year! This year, HdR is pleased to announce that there will be an exclusive Conversations with Châteauneuf-du-Pape event, led by author Harry Karis, vigneron Philippe Cambie and Sommelier Kelly McAuliffe. After the seminar, which is sure to sell out well in advance, dinner will be served at Bisto Laurentin. These limited tickets are available a la carte at www.hospicedurhone.org. Sadly the dinner is sold out at this time. This year, the seminars will focus on highlighting the last 20 years of Hospice-Du-Châteauneuf producers who have been center stage. I am especially looking forward to Why Spain (continues to) Rock – which will focus on what is happening today in Priorat and beyond. Another fantastic seminar will highlight Walla Walla once again, with The Return of the Bionic Frog (say wha? ), where Christophe Baron of Cayuse will make his debut at HdR. On Saturday, France will be showcased with A Collective Quest, highlighting Les Vins de Vienne. Finally, the seminars round out the day with Research, Revelations and the Art of Being Different. Here, Chester Osbourn of Australia’s d’Arenderg will explore how recent studies in geology and sub regions have changed his winemaking and growing practices since his last HdR appearance in 1999. Phew! But that’s not all kids. Like a Ginsu knife commercial, the weekend is jam packed with more tastings. The Rhône Rendezvous is back, where over 100 producers from near and far will share their Rhône wines from large-format bottles. To complement this BIG evening of BIG bottles highly-acclaimed chefs from Blackberry Farm in Tennessee will serve up a taste of the South in a BIG way. But before that you need sustinance, right? If you’re not entirely dead by this point, don’t forget to participate in the Rosé Lunch, which is always a treat. This year, our friends from The Girl & Fig will fill us up with deliciousness once again! Remember the pot de creme from years past? Um yeah. MORE PLEASE! I had to taste all three flavors, and I almost left with some in my purse. The rosés for this delecitble feast will be provided by the attending producers, which is a departure (and a welcome one for variety’s sake). If you are sufficiently recovered from Friday and still have steam after the final two seminars, the Saturday Grand Tasting will feature over 130 winemakers pouring tastes from around the globe. It has been said that to duplicate this tasting, one would need a passport, many weeks off work and thousands of airline miles to taste the variety of wines showcased at the Grand Tasting. Many producers who poured at the Rhône Rendezvous will also pour here but they will be featuring different wines. On Saturday, the Live Auction wil lleave you tingling as lots of sought after wine are hard won and wine washes down the lunch provided by Guadalupe. If you’re still upright at the end of the day, the Farewell BBQ promises a lot of beer, dancing, and casino action to wrap up your weekend. After that, you can explore the other wines that Paso has to offer on Sunday! Or if you’re like me, sleep in, eat a lot of carbs (and bacon naturally) and then head back home with a belly full of delish Rhône and a weekend of memories. A full weekend pass (highly recomended) is $795 but now is the time to save up! It’s so worth it. You can also opt to purchase events a la carte, but by the time you add up a couple of seminars ($155 each) and tasting events ($100-125 each), lunch and dinner, you might as well get the pass. Hope to see you there! This year promises to be bigger and better, so if you do only one Rhône event, do this one! Pretty great post. I simply stumbled upon your weblog and wanted to mention that I have truly loved browsing your blog posts. After all I’ll be subscribing on your rss feed and I’m hoping you write again soon!